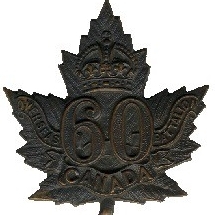 April 1917 – The 60th Battalion C.E.F. "Victoria Rifles of Canada"
The 60th Battalion paraded to hear Lt. Colonel Gascoigne’s farewell message and were then dispatched to their new units.